The 81st edition of the Thessaloniki International Fair (T.I.F), will be organized by the National Exhibition Organization TIF-HELEXPO, from 10-18, September, 2016. The event includes a vast program of parallel events, B2B meetings, especially after the acceptance of the Russian Federation to becoming the Honored Country in this year’s edition. T.I.F. being already the most known trade and consumer exhibition in Greece and after taking over from three consecutive very successful and rewarding editions between 2013 and 2015, is expected to welcome more than 250,000 visitors and become an exceptional organization due to the increased numbers of exhibitors, the special thematics and its innovative profile. 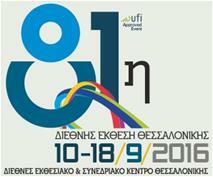 T.I.F, being the only Exhibition in Greece which hosts the International Participations as official state participations, gives the opportunity to each country to present its products and commercial capacities to the business world as well as to make its culture and civilization known to the public. There are several Thematic Sections that characterize T.I.F and the one which hosts all the International Participations is this with the distinctive name KOSMOS (World). This is the section which attracts most of the interest of the thousands of visitors that enter the Fairgrounds of our Exhibition Center every year during the organization of T.I.F. Apart from KOSMOS, several other thematic sections are included in TIF this year, like: Automobiles, Construction, Energy, Ministries & Authorities, Farm fair, Book market, Innovation & Technology, Information & Development, E-Gaming, etc. For more information and the relevant documents for participation, please see HERE.